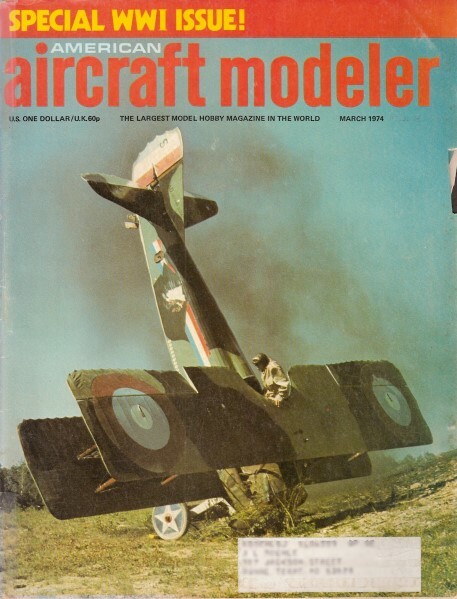 Website visitor Ken E. wrote to request a pair of two articles from the "For the Tenderfoot" series that was a regular feature in the AMA's American Aircraft Modeler magazine. 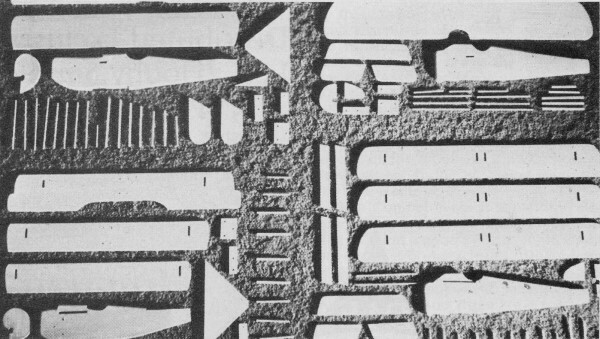 The first one, which appeared in the May 1974 edition, was titled, "Monsters and Monoplanes." As was typical, all the models are 1/2A powered control line with sheet (profile) fuselages and flying surfaces. This series represents World War I era designs with two bipes and two tripes! The plans are very well done and include lots of detail for insignia. Enjoy. Build four all-balsa 049 control liners from the plans and have some combat. They are lively fliers of WWI vintage. Nostalgia flies again! By yourself, friend against friend, club against club, or Snoopy versus the Red Baron - it all adds up to one thing: Super Fun Combat. All of the airplanes stunt. 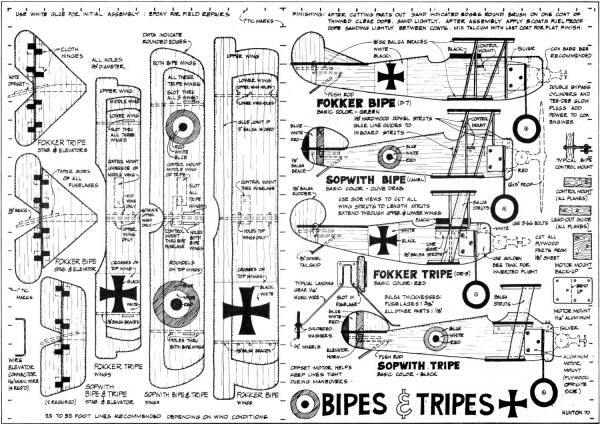 The bipes are a bit faster than the tripes, but the tripes are a bit snappier than the bipes. Even match? You bet your dog-house! Have you ever been chased by a Fokker, tried a snap loop to get on his tail and cut your own streamer in the process? Has a Sopwith ever bounced his wheels off your top wing, received four prop slashes in his fuselage, only to fly off into the sunset flaunting h is uncut streamer? No? 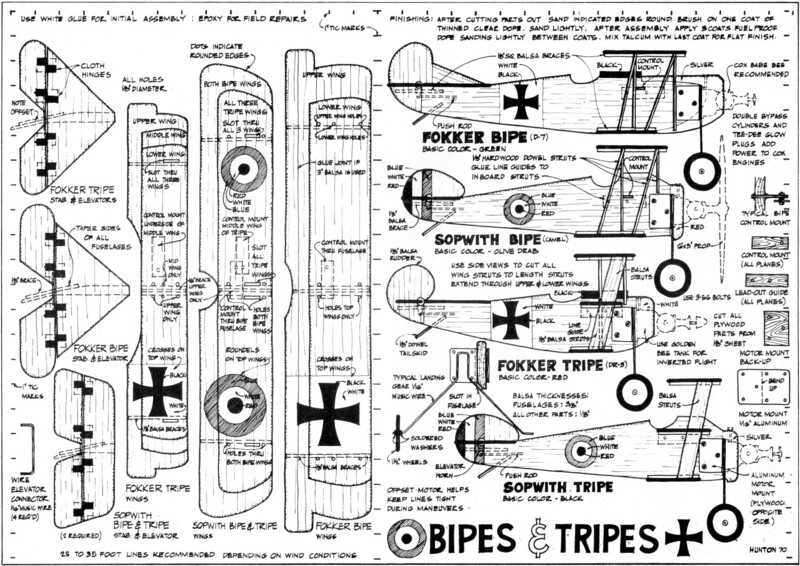 Well, clear the workbench, because Bipes and Tripes are here! Tripe shows how the engine is attached with the aluminum mount. Mount and engine alterations are explained in the text. You can make a wooden mount if aluminum is not available. (Above and Below) All these parts and pieces make all these nice bipes and tripes. 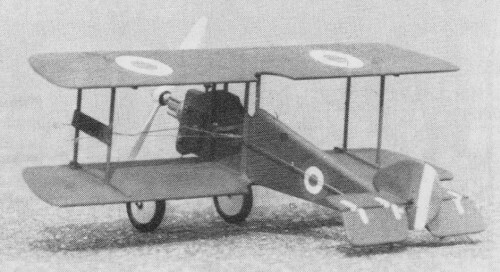 Sopwith bipe (Camel). Color it olive drab, put some decals on it and the allies have a machine to do battle. 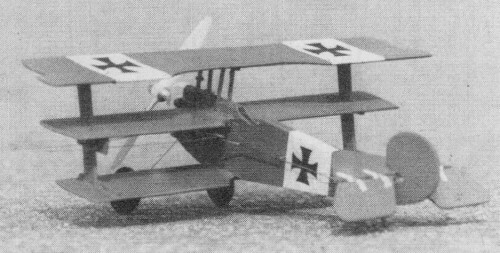 Fokker tripe, the challenger, is a tight looper, but not quite as fast as the allies' planes (in model form). Paint it all red, then add the black on white crosses. Materials needed are 1/8" thick, four-in. wide balsa sheet for the wings and tails; 3/8" thick, four-in. wide balsa for the fuselages; a small sheet of 1/8" plywood for motor mount backing and control horn mounts; 1/8" hardwood dowels for wing struts and tail skids; 1/16" wire for elevator connectors, pushrods and landing gear; a sheet of 1/16" aluminum stock for motor mounts; and 1/8" sq. sticks for wing and tail strengtheners. 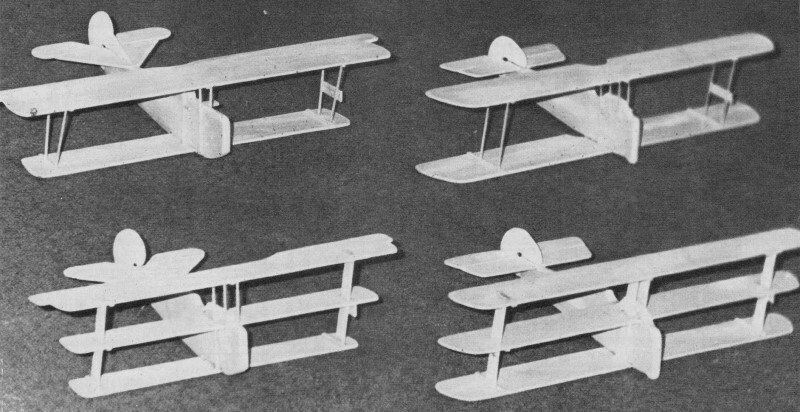 Here is what you will need to build all four airplanes: Six 1/8 x 4 x 36" balsa sheets; one 3/8 x 4 x 36" balsa sheet; one 1/8 x 6 x 12" plywood sheet; two 1/8 x 1/8 x 36" balsa sticks; four 1/8" round x 36" dowel stock; three 1/16 x 36" music wires; one 1/16 x 6 x 12" aluminum stock (See K&S display at the hobby shop. ): four 1/2A bellcranks; four 1/2A control horns; four sets 1 1/2" Williams WWI wheels. Here are a few pointers for mounting and aligning the wings. Bipes: Glue the bottom wing on first and let it dry. Pre-cut all struts and glue only the fuselage struts in place at the locations shown on the plans. Let them dry. With the fuselage and bottom wings flat on a board, place top wing on center struts (strut holes should be drilled all the way through the wings); prop up top wing tips to level the wing and make sure the leading edge is parallel to the bottom wing leading edge. Glue the center struts to the top wing. When completely dry, add end struts and 1/8" balsa braces. Tripes: Glue center wing in fuselage first. When dry, glue bottom wing and align with center wing. Add balsa struts and center fuselage dowels and let dry. Add top wing and 1/8" balsa braces last. The heavy aluminum motor mounts can be cut with tin snips or a razor saw. If you have an old aluminum lawn chair, the arms are pre-bent and need only hack sawing into proper widths. Screw the motor mounts to the fuselage before attaching the engine. The engine is held to the aluminum mount with 2-56 nuts and bolts. Before mounting motor, some alteration is necessary. Remove the four screws from the back of the tank; then turn the front part, with the cylinder pointed to the right side (needle valve, still upright), and reinstall the screws. The landing gear is wedged between the engine and the aluminum mount. This gear is a good safety indicator because if the gear falls out, you know your engine is loose. The roundels and iron crosses can usually be found in decal sheets at the hobby shop. Basic colors are indicated under the names on the plans. Remember, lots of super pilots in WWI had their own special paint designs, so feel free to use your imagination. Please write to AAM if Bipes and Tripes are popular in your area. Pictures, types of events in which you use them and other data would be appreciated because ... Monsters and Monoplanes are now flying their test program. Your interest in this type of 1/2A fun will get that published, too!